Blighty's Tuck Store attracted a lot of attention recently when the Toronto Star newspaper published an article about Melton Mowbray pork pies and mentioned Blighty's as one of the Greater Toronto Area's vendors of such pies. In fact, we were top of the list. The pies in the store are made by a former Marks & Spencer owned company called Churchill Pies (how very British). As you can see from the picture, I didn't pay too much attention to making the pie shell look elegant but the pastry really did turn out well. It tastes exactly like pork pie pastry should taste. I didn't chop my pork up finely enough so the texture of the pie filling is not as smooth as I expected. But the taste? Slightly different to commercial pork pies. I suspect my pie tastes a little different because I used very lean pork. 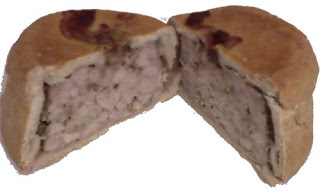 Commercial pork pies tend to contain some fat. Actually, I was surprised how lean the meat in Blighty's Churchill brand pork pies is. 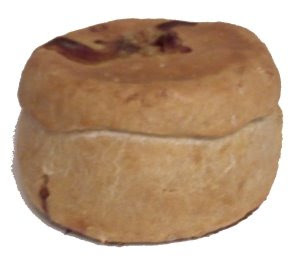 My memories of pork pies in the UK is that they were very fatty indeed. If you want to duplicate the taste of a real British pork pie try using a fattier cut of pork. I also misread the recipe and added the gelatin before baking. Most of it bubbled out of the hole in the top of the pie while it was in the oven. By the time I realized my mistake I had already sliced the finished pie so it was too late. One final note: Some customers have asked how to heat up pork pies. Aaaarrrgghh! Don't heat pork pies!!! Pork pies should be enjoyed cold with your choice of pickle. An afterthought. Why are these pies called "Melton Mowbray style"? Because they were originally made in Melton Mowbray, Leicestershire, England. Under EC trading rules, the name "Melton Mowbray" is protected. Does anyone know the contact details for the Churchill Pie company please? Is that they name they trade under? I can't seem to find anything online.